European Parliament Elections leave Bulgarian Evangelical Churches with no venue of political support. 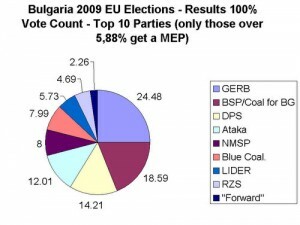 As an EU member, Bulgaria voted in the EU Parliament Elections on June 6, 2009. After the 100% count, it was announced that GERB (new centrist party led by Sofia’s mayor Boyko Borisov) has won 24.48% of the votes with 627,693 votes. The Socialist Coalition for Bulgaria totaled 476,618 votes or 18.59%, the Turkish Movement for Rights and Freedoms (DPS) received 364,254 votes or 14,21%, the Nationalist Ataka got 307,985 or 12,01%, the National Movement for Stability and Progress (NMSP) of former Tsar and former PM, Simeon Saxe-Coburg, secured 205,145 votes or 8%, and the democratic Blue Coalition got 204,784 or 7.99%. 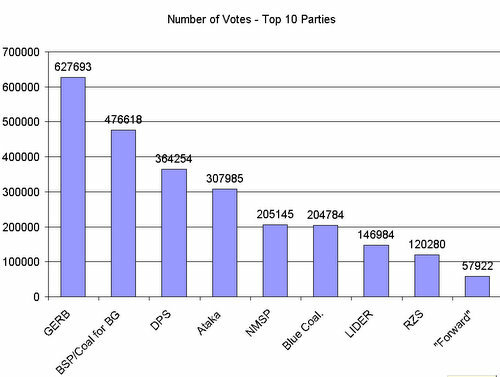 The other surprising result are the 120,280 votes (4.69%) for the Order, Law, and Justice (RZS) party – considered to be a low one and Coalition Forward which received 57,922 votes or 2,26% of the vote. The Central Election Committee says that the second count was most likely to conclude Tuesday when Bulgaria will officially announce the names of the country’s 17 European Parliamentarians. If these results persist on the upcoming elections for Bulgarian parliament on July 5, 2009, the centrist movement will have to join forces with the democrats to form a majority coalition against the strong left socialist wing. These political dynamics will implement EU political doctrine in Bulgaria for the next four years, leaving the Bulgarian evangelical churches with no venue of political support. On one hand, if the socialists continue to lead the country, the Bulgarian Evangelical Christians will be placed again under the pseudo “anti-sectarian” attack, which they have experienced during the past several years. If the centrist party becomes a leading power in the Bulgarian parliament, the evangelical churches will be forced to comply by European standards including gay marriages, abortions accompanied with the usual for Bulgaria corruption and crime.